Maybelline Facestudio Master Chrome Metallic Highlighter Makeup effortlessly envelopes the skin in a molten metal sheen. Meet the secret to brilliant and luminous skin. This highlighter powder drenches skin in a melted metallic finish. Maybelline's pearl pigments leave a reflective finish for a brilliant glowing skin. About The Brand : A world renowned cosmetics brand, Maybelline New York is known for its scientifically-advanced makeup formulas, revolutionary textures and up-to-the minute, trendsetting beautiful makeup products that are affordable and make you look effortless and stunning. With Maybelline, it's all about empowering women to make a statement and explore new looks each day! Explore the entire range of Highlighters available on Nykaa. 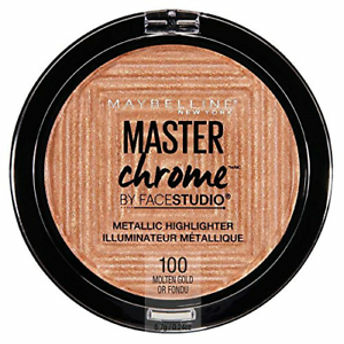 Shop more Maybelline New York products here.You can browse through the complete world of Maybelline New York Highlighters .